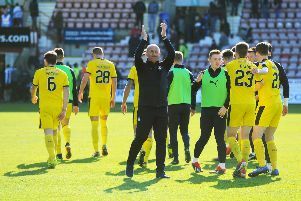 Falkirk picked up an incredible 3-2 win at Inverness Caledonian Thistle, ending the home side's 25 match undefeated streak and lifting themselves off the bottom of the table. Scott Harrison's goal in the last minute of stoppage time added to a first half double from Zak Rudden, with the home side's goals coming courtesy of Tom Walsh and George Oakley. Inverness took the lead within six minutes and, given their positive start to the match, it looked as if they could run away with it. Liam Polworth slotted Tom Walsh through on goal for the opening goal, with the midfielder slotting under the exposed Fasan from close-range. Inverness looked most likely to go on and grab a second - with Falkirk's game plan seemingly out of the window. Zak Rudden's 30 yard effort was a sign of his early intent and confidence, but it was never testing Mark Ridgers in between the Inverness posts. Scott Harrison was the Bairns' hero, knocking in at the back post. Rudden, though, struck after a quarter of an hour, nodding in unmarked from four yards. Petravicius' cross was on the money, and Rudden had the simplest of tasks. Leo Fasan had a great save to make just before the half hour, denying Aaron Doran with his foot down to his right side. Falkirk then went up the other end and, with seemingly their second chance of the half, grabbed the advantage. A stroke of brilliance from 18-year-old Rudden, who clipped the ball past Rooney, went round him and hammered his finish through Ridgers, off the post and in. Into the second half and Inverness began dominating the play - George Oakley clipped over the bar from just inside the six yard box after good play from Shaun Rooney. Caley Thistle levelled the game on the hour mark, sloppy Bairns defending allowed Oakley to glance a header in after a corner to level the scores. Just moments earlier, Paul Paton had a great effort saved from 20 yards. Zak Rudden was denied a hat-trick with ten minutes to go, he was alone but took the ball 30 yards before firing low at Ridgers. But the best was still to come. After defending a few dangerous Inverness attacks, Falkirk won a free-kick 30 yards from goal. Paul Paton, on free-kick duty for the afternoon, whipped in a perfect delivery and Scott Harrison bundled the ball in at the back post - sending the visiting support into raptures. The players stayed on the park long after the final whistle celebrating with the supporters, who were going wild. This feels like it could be a real turning point for the Bairns.